Located in the prestigious guard gated community of Bell Canyon this charming and immaculate Architectural Spanish offers sweeping Canyon views from throughout. Lush gardens create a true sense of privacy from the front with custom gates that open onto a quaint courtyard entry. The Open floorplan was thoughtfully crafted to take advantage of this truly special setting with inspiring serene views from almost every room. At the heart of the home the center island Kitchen was recently remodeled to create an open and inviting area any gourmet cook would feel at home in. The family opens directly off the kitchen with wood beamed ceiling and those amazing views. The comfortable dining room is lit by a romantic chandelier offers incredible sunset dining. The living area is the perfect spot to gather and entertain with walls of glass onto the inviting yard and decks. Upstairs the spacious light-filled central hall takes you to the generous secondary bedrooms. One the bedrooms was designed to be used as a flex space perfect for a spacious second family room or library. The master suite offers the perfect retreat with vaulted beamed ceilings, huge views and a spa like master bath complete with whirlpool tub and a dry sauna room. 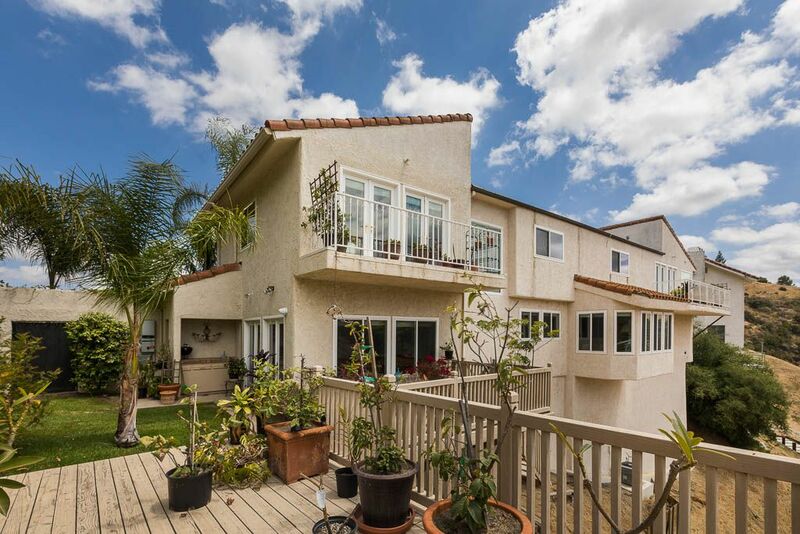 The rear grounds offer lush gardens with a spacious grass area and huge sunning terraces set against the backdrop of the beautiful Santa Monica Mountain Nature Preserve. A truly inspiring living environment for you to call home.